Cuba received 3.5 million visitors last year, up nearly 18% from 2014. The island is the biggest opportunity for tourism in the Caribbean in the next five to ten years. For now, it ranks second to the Dominican Republic, with over five million visitors. The exciting news is an imminent positive demand shock, which will also vitalize the country’s real estate sector. From the United States came a mere 147,000 visitors in 2015—but this even though Cuba technically continues to remain the only country in the world that U.S. citizens are prohibited from visiting as tourists, and up 74% year-on-year. The number of visitors from the five largest countries originating tourists bound for Cuba are all up as well. Together, arrivals from Canada, Germany, France, the UK, and Italy grew by 17.6% from January-November 2015. Even faraway China, not a factor yet but likely a future power in tourism, originated over 25,000 tourists in the first eleven months of 2015. Moreover, Air China established direct flights with a stopover in Canada for the first time in December 2015. The island currently offers 62,000 hotel rooms—not many fewer compared to the Dominican Republic’s 70,000. Notwithstanding, there is already a shortage of supply in suitable rooms today. U.S. sanctions provide additional time for the country’s tourism industry to get ready for growing demand. More than 13,600 rooms are expected to open in 2016 in beach locations, but formal sector expansion plans are nevertheless unlikely to be sufficient. Current government plans foresee an expansion to 85,000 rooms by 2020. The comparable upon which U.S. tourism demand will converge eventually is the Dominican Republic, with 1.78m U.S. visitors in 2014. Current American visits would have to rise 12 times to reach the number of visitors to the Dominican Republic last year. The question is not if, but how long it will take to get there, how much visitors will spend on the island, which kind of infrastructure they will use, and how the Cuban government will support this process. With the right strategic, policy and investor support, doubling arrivals to 7m by 2025 is doable, and possibly many more. For context, the Dominican Republic has a stated policy goal of 10m visitors by 2023. New air and ferry links will already provide greater convenience of travel to Cuba in 2016. The U.S. State Department estimates as many as 110 new flights to the island in 2016, with as many as 20 per day to Havana and 10 to other airports in the country. And the ongoing cruise ship season from December to April alone foresees at least 14 vessels docking at the island with a total of 90 visits, bringing 600,000 visitors. Cuba’s “megacity backlog” means that forward-looking urban regulation is likely to come on stream in the coming years. This will give an edge to real estate developers who are well versed in modern building technology, including smart and energy efficient buildings. The currently binding constraint is the large number of rooms that are out of service for lack of repair and maintenance. Cuba’s occupancy rate is lower than that of the Dominican Republic, which stood at 71.2% in 2014. Jose Luis Perello, professor at the Faculty of Tourism at the University of Havana, argued that the main bottleneck to meet growing demand is not the lack of capacity. Adding all the accommodation capacities for tourism in the country, hotel occupancy does not exceed 60% of the available capacities, he said. To rapidly undertake the renovation, maintenance and modernization of its accommodation facilities is the main challenge facing the development of Cuba’s tourism industry today. Tourism has captured about 16% of foreign investment in recent years, with 26 joint ventures offering some 5,000 rooms and management contracts with 18 international hotel chains in 69 hotels, offering 35,892 rooms. Foreign capital is involved in the management of 66% of the rooms available in the state sector. This still leaves one third of capacity run by state-owned firms that do not have the flexibility, mindset nor capital endowment to invest in aggressive upgrading and marketing. Private hosting alternatives marketed digitally are also bound to grow quickly, as Airbnb is already showing. At the beginning of 2015, the private sector counted 18,742 tourist rooms registered. Later that year, a figure exceeding 19,000 rooms was recorded, reaching 21,000 rooms at the beginning of 2016. A compound annual growth rate of 12% would double the capacity of private rooms in a little over six years. However, with U.S. tourism demand fully coming on stream, the growth rate could be more in the order of 20-25%, doubling capacity in a little over three years. 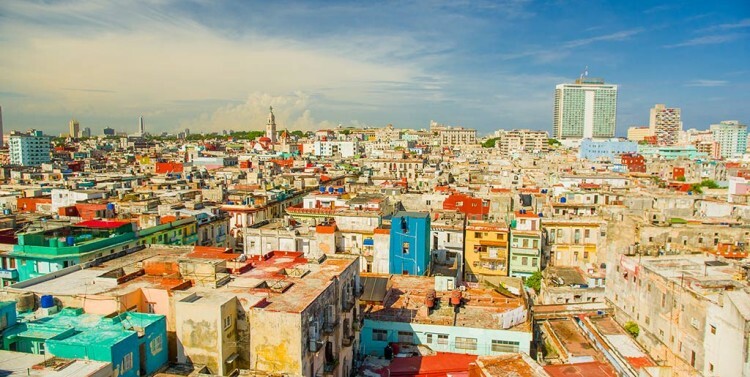 “How Tourism Is Boosting Cuban Real Estate” provides guidance for investors who want to understand and seize the opportunities tourism is now creating for real estate in Cuba. Real estate is always a localized business and thus contingent on properly assessing risk and opportunities. In particular, when locking up capital in physical assets, it is important to form well-founded views on long-term asset prices, security of title, ability to buy and sell, ability to rent, property taxes and fees, ability to contract repairs and maintenance and at which cost, as well as ability to enter and withdraw foreign currency from the island. Accessing the right relationships is essential to ensure the speedy and successful execution of real estate value creation strategies on the island. Maximilian Martin is the Founder and CEO of Impact Economy. His investment and advisory work has helped define the trajectory of market-based solutions and the impact revolution in finance, business and philanthropy. Dr. Martin created Europe’s first global philanthropic services and impact investing department for UBS and the UBS Philanthropy Forum. In 2013, he wrote the primer on impact investing “Status of the Social Impact Investing Market” for the UK G8 policy makers’ conference. His new book “Building the Impact Economy” shows how to reconcile responsibility with opportunity and seize the multitrillion-dollar opportunity in the wings in frontier, emerging and established capital markets.